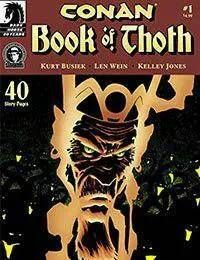 Legendary writer Len Wein, creator of Wolverine and Swamp Thing, teams up with Conan ongoing writer Kurt Busiek and the grand master of horror art, Kelley Jones, to tell the horrifying origin of Thoth-AmonConans greatest adversary! In the dank alleys of a decaying city, one beggar boy conjures visions of a future where, instead of spitting on him in the streets, the rich and privileged cower in fear of his terrible power. For young Thoth, hunger and pain are a way of life, twisting his heart into believing that no wickedness is too costly if it can afford a means of escapenot even the betrayal of ones sole confidant in the wretched, unfeeling world. With art by the inimitable Jones and a script by Busiek (responsible for the most successful relaunch of a fantasy character in comics history) and Wein (mastermind behind many of comics most beloved modern heroes), this series finally reveals the secrets behind the dreaded sorcerer Thoth-Amon!